Materials recovery facility (MRF), also known as materials reclamation facility or materials recycling facility, solid-waste management plant that processes recyclable materials to sell to manufacturers as raw materials for new products. MRFs are generally classified as either “clean” or “dirty,” depending on whether the facility handles materials that are mixed with other municipal waste. MRFs play an important role in reducing the waste stream, the demand for raw materials, and pollution associated with the manufacturing of new products. A clean MRF takes in commingled recyclable materials that have been separated from municipal solid waste, usually by individual citizens or businesses before curbside trash collection. Although some clean facilities are single stream (i.e., all of the recyclable materials are mixed together), many are dual stream, or source-separated, which means that they receive one stream of mixed paper and one of other materials such as glass, nonferrous metals, and plastics. The recyclables are sorted and then prepared for market. Nonrecyclable or contaminated materials are separated out, but they generally amount to less than 10 percent of the total stream of waste taken in by a clean facility. 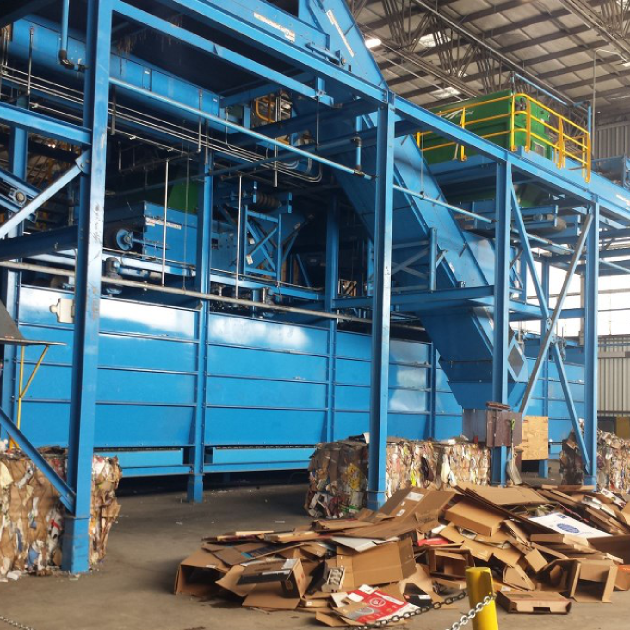 A dirty MRF takes in a broad stream of solid waste and separates out recyclable materials through manual and mechanical sorting. The recyclables are then processed for market, and the nonrecyclable materials are sent to a landfill or other disposal facility. The amount of recyclable materials recovered by a dirty MRF can vary widely but usually does not exceed 30 percent. Because a dirty facility does not rely on residents or businesses to correctly identify recyclable materials and processes 100 percent of the waste stream, the quality of recyclables recovered from such facilities is lowered by contamination with moist garbage and broken glass. It is estimated that only 5 percent of MRFs in the United States are dirty facilities. MRFs use a series of conveyers that carry recyclable materials over sorting screens or other mechanisms that divide the materials. As single-stream recycling becomes more common, more facilities are designed to accept and separate various types of recyclable materials. Automated systems can sort a number of materials simultaneously, such as paper, cardboard, aluminum, plastic, and glass, using such tools as magnets and ultraviolet optical scanners. The mechanized process is augmented by workers who sort items by hand.